I still remember those long Sunday drives up the Bayshore, through the city and over the Golden Gate Bridge, on our way to the country, with the three of us sisters sitting in the backseat (without seatbelts) of our parents ’49 Plymouth. The backseat felt huge and as we sank into the cushions, barely able to see out the windows. Being the youngest, I saw only the sky as we rode over the bridge wanting to so badly to see the wide-open spaces of the ocean that stretch out to the west of us. My sisters would often exclaim, “Look, I see a boat out on the bay, an unusual sight in those days. My excitement soon overtook me and I cared less about the ocean or the boat, as we got closer to The Ranch. The Ranch was where my cowboy Uncle Bill lived with his wife, Julie and their horses. The Ranch is where the haylofts, buggies, horses and hammocks were beckoning me to hurry up. As my mind swiftly began to enjoy my time there, I tried to stay calm but to no avail, annoying the heck out of my older sisters. When we’d come to that last bend in the road, one of our parents would always say, “First one to see the house gets a pony” and we would immediately sit up, straining to look over the high front seats, wanting to be the one who gets that first glimpse of Uncle Bill’s Ranch. I’d yell, “I see it, I see it” simultaneously with one of my sister…….” jinks, jinks you owe me a coke” she says to me as I waited in anticipation of getting out of the car and breathing in that wonderful hay and horse fill country air. As far back as I can remember, I have always been tantalized by the smell of horses and hay. As we climbed the big wooden stair to the front door, it swung open and there in its huge wooded frame stood my tall, rugged and good-looking Uncle, welcoming us into their home. I was instantly engulfed with the familiar smells of leather, wood stove and wool rugs as if warm caring arms were wrapping themselves around me. I loved that feeling. I loved that place. I loved being there. I was in awe of my cowboy Uncle Bill. Everywhere I looked; there was evidence of his personality and passions. The simple Craftsman home fit their style and needs, two bedrooms and a bath, with an all-in-one living and dining area. One of the first things I did upon arriving was to go look in my Uncle’s bedroom. This bunkhouse style room was a delight for me, a one-day-only cowgirl. The walls were paneled and hanging from them were his stirrups, holsters and a Stetsons hat. He had a wooden bunk bed with an original Indian blanket for a cover. Being born and reared near a Montana Reservation, the whole family was familiar to the ways and wears of the Crow and Blackfoot. The wooded rocker atop a wood floor was the only other piece of furniture besides a small dresser. The room spoke western, cowboy and manly. I could just feel myself on a ranch is the wilds of Montana. Stark is a good first impression but I could see his past and his present lifestyle all wrapped up in one. If I was a cowgirl that day, this was my favorite room and I remember thinking that it must have smelled like a bunkhouse. This was heaven to me or at least what I thought heaven should be or was it just that I was always so happy to be at the Ranch. To me it felt like we had driven to another world or maybe Montana, for surely this is what Montana must be like. I was sure the books I would read could never give me the thrills and adventures I had on the Ranch. It was beginning to get dark as we climb back into the backseat of my parent’s car and begin our trip home. 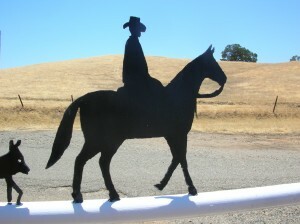 That cowgirl was being left behind waiting for my return…..and I would return. By the time we started over the bridge I would sit in anticipation of the foghorn as it signaled the approaching ships that the “gate’ into the bay, was near. As we winded our way south through the city, I would slowly return to that city girl who had arrived at the Ranch just that morning. My day-visit felt like a month, a place to become whoever I wanted to be and use my imagination in ways the city could never provide for me. The many adventures left me tired for sure but bored, never!